We have covered the XJ-S’ stylistic development in some detail already, so I’d rather not retrace old ground, but what I haven’t addressed is the matter of what external designs could conceivably have been pinned to Malcolm Sayer’s moodboard, should Jaguar’s aerodynamicist and self-confessed non-stylist been in possession of such a thing in 1968-70. Firstly, it’s worth reminding ourselves that XJ-S (or to call it by its experimental code, XJ27) was to have a low penetrating nose for aerodynamic reasons. The very earliest Sayer drawings (seen below) illustrate this, as indeed do photos of a quarter scale model of the XJ27 bodystyle used for preliminary wind tunnel tests. It’s believed that the threat of proposed US lighting regulations prompted Jaguar to abandon this arrangement. The adopted headlamp treatment was not uncommon during the latter Sixties, influenced perhaps by earlier designs emanating from Detroit and most notably by Pininfarina’s 1961 Cadillac-based ‘Jacqueline’ study, in which the headlamps and grille became a single unified whole – a treatment reprised on Peugeot’s 204 of 1966. Headlamp / grille treatments for the 1962 Jensen C/V8, Bertone’s 1964 Gordon Keeble (by Giugiaro) and Touring’s Lamborghini 350 GT could also be said to have lent influence, but it’s Pininfarina’s Ferrari 330 GT 2+2 of the same year which perhaps comes closest in spirit to that of the definitive Jaguar arrangement. However, before we get too carried away, we should also look to the nascent XJ4 project at Browns Lane, a series of styling studies overseen by Sir William Lyons in conjunction with Fred Gardiner from around 1961-64 when the definitive style was established. This car, which ultimately became the 1968 XJ6, began life as a four-seater personal luxury coupe with E-Type connotations. Several of these proposals contain frontal elements which appear to reflect Italian carrozzeria practice at the time. So was Lyons merely referencing what he saw around him, or was it simply a case of creative coincidence? Possibly both, but either way, once XJ27 diverged from Sayer’s original intentions, the adopted nose treatment made a clear reference back to those early XJ4 frontal styles. Looking at Sayer’s original styling sketches above, it’s clear that XJ27’s eventual style was already there or thereabouts in the lineal wing line, the pinched bodyside crease running the length of the car, the cut-off tail and truncated canopy. However two designs from this period exhibit some similarities, the 1963 Pininfarina Lausanne and the 1967 Mazda Cosmo, combining (somewhat) uncluttered surfaces, similar canopy treatments and elongated tails. However, what muddies the water further is the fact that Sayer had to some extent been working towards this style with the car which preceded it. The stillborn XJ21 programme was a 1967 / 8 reskin of the E-Type which fell prey to regulatory complications, a lack of funding and of impetus. It does however embody the XJ-S’ stylistic missing link. It is here of course that XJ27 really went off-piste. Eschewing the classic Lyons style or indeed the previous soft-surfaced Sayer treatment, the result was again dictated by aerodynamic concerns. The first exponent of the fin-shaped buttresses (or sail panels) remains debatable, but Pininfarina certainly were amongst the earliest adopters. A one-off 1954 Ferrari 375 MM for film director Roberto Rossellini is perhaps the earliest example of the buttress feature, one which would become something of a carrozzeria trademark. We should also look to the rear three quarter treatment of Ercole Spada’s 1963 Lancia Flavia Zagato, where the merest suggestion of the Jaguar’s sail panels can be seen. Also worth noting are the Lancia’s tail-lamp and bootlid treatments. Now it’s worth restating that while Lyons was something of a creative magpie, Malcolm Sayer marched to a drumbeat very much his own. Therefore, it’s debatable how much account he might have taken of external stylistic influences. The answer to that question is likely to have been some, but not in any way that would dilute the purity of his calculations. So if no car design is created entirely in a vacuum, is it possible the XJ-S was? Certainly from the researches I have made, I can discover little to back up the assertion that headlamp treatment apart, the XJ-S was overtly influenced by any pre-existing car design, but with almost nobody left who could confirm our educated guesses, are we left to conclude that XJ-S remains the exception that proves the rule? The first twin fins I remember were on the Bristol 450 of 1953. This helped stability in high-speed cornering — and for 2-litre cars they were very fast. They were entirely Bristol’s own invention, and no long “boot” area was needed on an out-and-out sports-racing car. As for the XJ-S, I can’t see the 330GT influence, I’m afraid. What I know is that from any angle you just knew immediately it was a Jaguar. How they achieved that I can’t fathom. Yes the Bristol is an interesting one, with something of a tenuous Sayer connection in that he worked as an aerodynamicist for Bristol (on the aero-engine side) prior to his appointment at Jaguar. One comment I would make regarding the 450 is that given the number of changes made to the bodywork over the car’s short racing career, one can glean that Bristol’s aerodynamicists may not have got their calculations entirely right first time. Sayer’s D-Type, which debuted a year later seemed to have worked straight out of the box, which does seem to suggest that his did. “What I know is that from any angle you just knew immediately it was a Jaguar. How they achieved that I can’t fathom.” One thing we can say is that the combination of Lyons and Sayer (who it is believed worked quietly behind the scenes finessing most Jaguar road car designs) was unparalleled. They just seemed to instinctively know what made a Jaguar a Jaguar. It was a very subtle combination of flamboyance and strict rectitude. Once both men were gone, Jaguar’s styling was left floundering. To some extent, it still is. For the lineage of intrinsic Jaguar qualities there’s a direct line between the SS-1 and the XJ-S. I can’t post pictures, but compare the two in profile and you will see similarities in stance, proportion, sense of elegance, and so on. You can clearly see they are both the result of the same line of thought. Look particulately to the window treatment, and I’m talking the four light SS-1 and not the one with a blacked out b/c-post. Even back in ’75 Jaguar seemed to have a customer based that wanted things to stay the same for ever and ever, and hated anything different. I think the XJ was a marvellous looking thing, it stood out when it was current and looks very exotic when you see one on the roads now. I personally think that the utterly absurd engine with unfathomably complicated ancillaries and control systems, economic conditions, and latterly dreadful reputation for quality hampered sales more than the styling. Sales improved dramatically with the addition of some quality and sane engine choices, but the styling never got any less unique. Obviously meant XJ-S was marvellous, although the XJ was too. Particularly in Series II form for me. I feel obliged to state that a late 5.3 HE engine is a very reliable unit. I obviously cannot judge the earlier versions, particularly the carburettored ones, but with a bit of effort to not rev it hard when cold (which is easy, given all that torque), the V12 won’t let you down in my experience. Not even in traffic jams on the Milanese Serenissima. While I’d agree that the engine itself is very robust indeed, the ignition system and cooling system are tiresome in the extreme! Jaguars traditionally employed very long production runs, so customers developed strong bonds which proved difficult to break once a new model did eventually arrive. No doubt loyal XK owners had apoplexy when the E-Type landed. Ditto the shift from Mark VII-IX to Mark X. Night and day. It’s unarguable that Jaguar’s attitude to the North American market didn’t really become sufficiently serious until the mid-’80s when they set up dedicated proving bases in Arizona and Timmins, Canada. Siting the V12’s ignition module in the centre of the vee wasn’t one of their better ideas either, a mistake they seemingly refused to acknowledge for far too long. Not a massive problem in temperate Blighty, but a whole other sack of potatoes in a Texas mid-summer. The V12 was complex, parts supply was patchy, as indeed were the repair shops who would even look under the bonnet. But aside from the problematic injection / ignition systems and some issues around cooling, the V12 is pretty robust. An interesting subject to be sure. I have always felt that the XJ-S styling reminded me of certain styling aspects seen in two American sport(y) cars that appeared some years before the XJ-S: the 1970 Chevrolet Camaro and the 1968 Chevrolet Corvette. The Corvette Coupe’s rear window and flying buttresses, while themselves also not new or original at the time, may have influenced the styling of the XJ-S.
With the 1970 Camaro, it’s the 3/4 front view that shows a similar dropped hoodline between two headlights. I would never argue it’s a total match by any stretch of the imagination but to my eyes it radiates the same “feel” as the XJ-S. Thanks for this Bruno. The ’68 Corvette is undoubtedly a strong contender and should really have been included. However Sayer’s ‘buttresses’ were not simply a styling feature, more an aerodynamic device, akin to the tailfin attached to the D-Type racing cars; their purpose being to smooth the airflow as it broke away from the roof over the rear of the car, reducing the drag-inducing wave vortices that would occur. The Camaro on the other hand is somewhat tenuous to my eyes when it comes to the XJ-S, although I think I can see what you’re getting at. But when we consider that by 1970, the Jaguar had to all intents and purposes been formalised – (detailing apart), I think we can discard it. Which isn’t to say it wasn’t influential in other applications within the wider GM empire. Hi Bruno: Those are plausible; the 1970 Camaro is a closer fit. Both cars are homogenous in their styling in the way the XJ-S isn’t. In proportions they do have the same character as the XJ-S. Thanks for those references. Definitely agree with you Bruno on the similarity of the 1970 Camaro, that has always been a thought of mine. As Eóin has pointed out, it’s more by chance than design, but the wing line, front arches, and general proportions and angles of the front end seem very similar to my eyes. Thank you Eóin, Richard and Ty for the comments. The exchanges of viewpoints and information to enhance what is already great in-depth content is what makes this website so good. Intrigued, I took another look at the 1970 Camaro and yes, I admit the wingline is quite similar, as is the central body crease. Interestingly, this connection carries additional weight in that Jaguar’s Bob Knight, who was heavily involved in the XJ-S’ styling and engineering latterly told chroniclers that Sayer had created something more akin to a Camaro, which he wasn’t all that enamoured with. 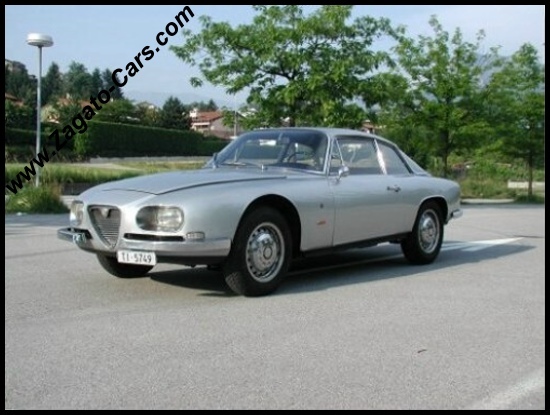 The Zagato 2600 Alfa is an interesting one, and I car I have a good deal of admiration for. I do feel there is a similar feeling to the forms, but I’m damned if I can rationally explain why. Most 2600 Zagatos were like the red one. Buttresses seem to be a rare type. Has nobody mentioned the Alfa Romeo 2600SZ Zagato yet? I can’t see much Jaguar in that. It’s a lovely car though.